Financial reports can be regarded as the primary means of communication between a company’s management and its shareholders. The reports also address all other kinds of stakeholders like employees, suppliers, customers, competitors, governments, potential investors, bond holders and, in a broad sense, the entire society. Still, it is questionable whether managers really deliver true information in their reports. One possible way of obscuring corporate information when results are negative, or of being forthcoming in disclosing information when results are good, is to adjust the reports’ readability which can influence understandability as a consequence. 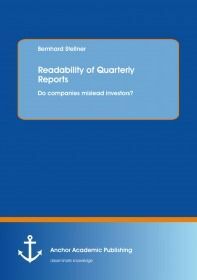 The concrete aim of this study is to focus on the readability of letters to the shareholders of bilingual (German and English) quarterly reports of listed companies at Frankfurt Stock Exchange. It is examined how various factors influence the readability of company reports.